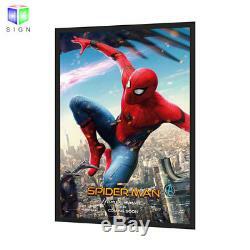 LED Backlit Movie Poster Frame. Frame thickness : ultra thin only 15mm thickness. Border cover: 30mm cover width. LGP: 3D laser engraving machine production it. Led light source: High brightness SMD2835led light source. Open method: open from four sides frame , easy change the poster. Dimensions Size 24" x 36" poser frame. Overall size- 637mmX941mm=25"X37" inches. Poster size - 610mmX914mm=24"X36"inches. Hanging way : back with hook. Size 27" x 40" poser frame. Overall size- 713mmX1043mm=27"X41" inches. Poster size - 686mmX1016mm=27"X40"inches. The item "24X36 with 27X40 Led Backlit Movie Poster Light Box Advertising Display Signs" is in sale since Wednesday, June 13, 2018. This item is in the category "Home & Garden\Home Décor\Frames". The seller is "hksign" and is located in Shenzhen, China. This item can be shipped worldwide.